Kallis shows his style with an impressive offside shot as England wicketkeeper Matt Prior can only watch on. (CNN) -- Jacques Kallis frustrated the England bowling attack with his 33rd Test century as South Africa closed the first day of the third Test in Cape Town on 279 for six wickets. It was a better position than the home side could have hoped for when they slid to 51 for three wickets in helpful bowling conditions after England captain Andrew Strauss won the toss and put them in. But Kallis combined with AB de Villiers, Mark Boucher and then Dale Steyn, in an unbroken stand for the seventh wicket of 63, to frustrate England. South Africa, who were thrashed in Durban to fall one behind in the four-match series, reacted by dropping paceman Makhaya Ntini to make way for Friedel de Wet. The move may well signal the end of Ntini's superb Test career after 101 appearances. The home side were immediately under pressure as James Anderson removed Ashwell Prince in the first over while captain Graeme Smith was dropped by Graeme Swann off Graham Onions in the next over. It was the easiest of chances and although Smith did not make them fully pay as he was third man out, the crucial opportunity to bowl at Kallis when the overhead conditions were the most helpful had been lost. Hashim Amla was leg before wicket to Onions for 14 to bring Kallis to the wicket and Smith gave Anderson his second wicket of the match to the first ball after lunch. 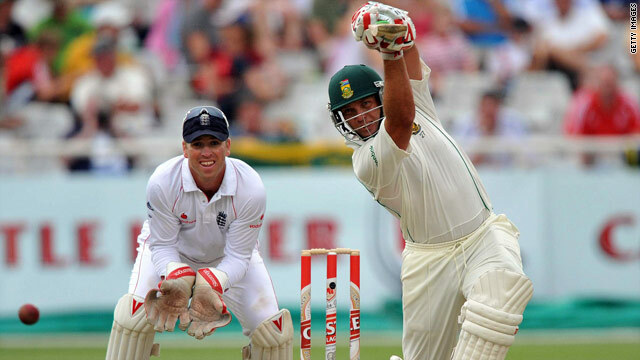 But then Kallis took command as he put on 76 with de Villiers, who fell to a sloppy shot to midwicket off Swann for 36. Swann then claimed the out of form JP Duminy first ball to be on a hat-trick, but Boucher confidently kept it out and then batted aggressively to dominate his partnership of 89 with the watchful Kallis. Boucher fell for 51, trapped leg before wicket by Stuart Broad, but useful lower order batsman Steyn kept Kallis company as he brought up his sixth century in Tests at Newlands. He was 108 not out when bad light saw play ended prematurely with England having just taken the second new ball. In other Test action on Sunday, Pakistan took an early stranglehold on the second Test against Australia in Sydney by bowling the home side out for a paltry 127 on the first day. Mohammad Sami took the first three wickets to fall including home captain Ricky Ponting and recalled Phillip Hughes for ducks. The equally impressive Mohammad Asif then ripped through the middle and lower order with a stunning six for 41 haul with Umar Gul taking the final wicket to fall in difficult batting conditions. Pakistan, who were thrashed in the opening Test in Melbourne, were 14 without loss by the close of a truncated day's play.